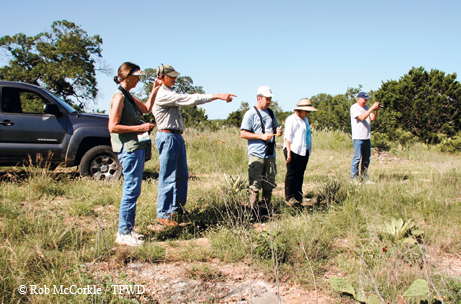 ﻿﻿﻿﻿﻿﻿﻿﻿Volunteers count winged marvels in the Hill Country. ﻿﻿﻿﻿﻿﻿﻿Deep azure skies greet 46 butterfly enthusiasts who gather on a June morning at a Medina coffee shop for a dose of caffeine and last-minute instructions before embarking on the fifth annual North American Butterfly Association (NABA) count at Love Creek. Rebecca Flack of the Nature Conservancy divides up the record number of volunteers into eight teams and sends them afield to scour the Bandera County countryside for the colorful winged insects. Leading our six-person team is expert Richard Kostecke, the Nature Conservancy’s associate director of conservation, research and planning. Amateurs and experts alike participating in the day’s count are all part of NABA’s standardized national event to discern trends in North American butterfly populations. The national count, says Kostecke, is patterned after the long-running national Christmas Bird Count but pegged to a Fourth of July season that stretches from June 1 through July 31. NABA also accepts U.S. butterfly data from spring and fall seasonal counts. Kostecke’s team, composed of myself and two couples, heads for the 2,100-acre Love Creek Preserve in the Bandera Canyonlands west of Medina. The former private ranch represents one of the nation’s most diverse habitats of spring-fed creeks, scenic mountains and steep canyons harboring remnant stands of bigtooth maples, Texas madrone, rare tobusch cacti and other native flora. At the top of the first hill, Kostecke strides into a field of native grasses, low-growing shrubs and oaks, his binoculars scanning for butterflies just beginning to become active on a pleasantly cool summer morning. With a checklist and notepad in hand and a camera sporting a telephoto lens slung over his shoulder, the entomologist looks like a consummate professional. The rest of us neophytes follow behind, trying to spot what in most cases is a fluttering insect no bigger than a dime. Kostecke calls out the names of species he sees — Reakirt’s blue, Gulf fritillary, dainty sulphur — tallying as he goes. ﻿Volunteers gathered to count butterflies near Medina as part of a national effort to track butterfly population trends. The group exceeded its goal of recording 60 butterfly species. Our team spends most of the morning hiking along the rocky Love Creek bottomlands, where butterflies congregate to obtain moisture and to feed on the plentiful nectar plants. The checklist provided by noted butterfly expert Tom Collins begins to fill up: juniper hairstreak, red-spotted admiral, clouded skipper, dun skipper, zebra heliconian. I strain through binoculars to admire the dainty creatures’ subtle spots and streaks on chalky powder-blue and yellow wings. Overhead, a broad-winged hawk circles and a small flock of aoudad sheep glued precariously to a canyon wall look down before scampering up and over the precipice to the plateau high above. The count continues for another hour before we call it a day. We end the morning with a respectable 19 species and more than 200 individuals. We point our sore feet toward our vehicles to head to the designated rendezvous spot — the Love Creek Apple Store in Medina. Other team leaders, who have returned from Medina Garden Nursery and nine private ranches, call out their species count for Collins to compile. The tally appears to have fallen just two shy of the 60-species goal, but several photographed, but yet unidentified, butterflies remain to be identified later. A week later, an e-mail from Flack notes that the subsequent positive IDs do reveal three additional species, nudging the total count to a record-high 61 species. She also points out that the five-year combined total for the Love Creek count has hit 84 species, a figure that represents more than 10 percent of the total number of U.S. butterfly species. In Texas, the Rio Grande Valley contains the greatest butterfly diversity — more than 300 different species. It’s no wonder the three-county area is home to NABA’s National Butterfly Center and Mission’s Texas Butterfly Festival, held this year Nov. 1-4. So grab a field guide, a good pair of binoculars and a camera and join a growing sport that one day may rival one of America’s other favorite natural pastimes — birding.